I love getting cards for people. Half the fun is planning in advance and getting something original instead of the normal quick dash to Target or Rite-Aid. It's always good to load up on some unique cards in advance. I do that for wedding and birthday cards as much as I can. So in honor of the next card holiday - I thought I'd share some nice Valentine's Day ones that I've found. 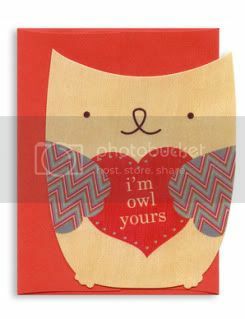 I'm sure its no surprise to my regular readers that I'll start with an "I'm Owl Yours" card from Kate's Paperie. Its a wooden card - which I love - totally eco-friendly. A bit expensive at the $8.95 mark though. Etsy is always a good place to check out for cards - and they can be more affordable too. I like this "Love You Like Whoa" card from the Love you Paperly shop. 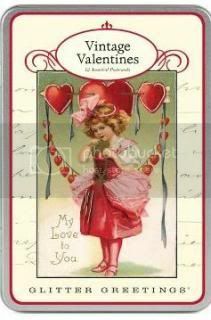 Vintage style valentines are always fun too. Paper Source has this set of 12 for $13.95 that is adorable. They always have such sweet and innocent pictures on them! The tin that they come in is cute too. Luxe Paperie has a nice mix of cards to choose from as well. My two favs? The Kate Sutton Choo Choo Choose You card and the Elum Designs plume letterpress that says "You make my heart go Boom Boom" - I mean, look at the lettering on that! Anyways, those are some places to start. I found some adorable Valentine's post cards on etsy too - but I don't want to share yet - since some of my readers might be receiving them! There's still time to order cards... don't wait last minute and end up at Target!